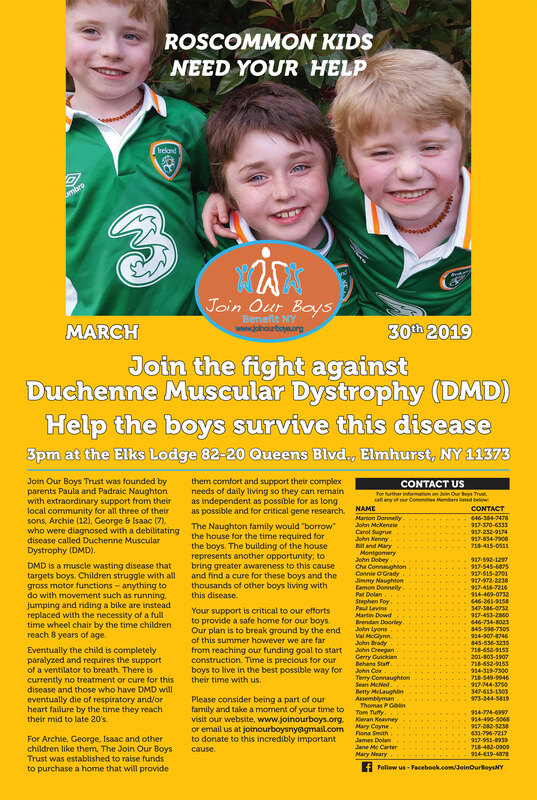 The Join Our Boys Trust is very grateful to Marion Donnelly and all her colleagues in New York involved with the planned Benefit for The Join Our Boys Trust. So much work has gone into the Benefit and it is a wonderful way to raise awareness of Duchenne Muscular Dystrophy and the catastrophic effect it has one everyone it affects. All funds from this Event will go directly to support the building project. The property, which is now under construction, in Roscommon Town, will enable Archie, George and Isaac to remain as independent as possible for the rest of their lives. In effect, the family will borrow the property for the remainder of the time they have together. It will be life changing for the family. Your generosity is appreciated much more than you will ever know. Thank you most sincerely. Sorry, online ticket sales are now closed. Sorry, online ticket sales are now closed.